Circular saws are one of the essential tools a woodworker can have, be it professional or just a hobbyist. Most any type of construction project requires a fair share of cutting, regardless of the project’s size. Circular saws are incredibly versatile and help to make quick work of a variety of materials -- not just wood. These saws aren’t a new technology by any means, so if you are in the market for one, you’ll notice that you have a massive amount of choices, making it a little difficult to decide on the best circular saw for your needs. Stressing out over the right circular saw to choose? Let us help. Below, you’ll find our picks for the best circular saws currently available, ranging from smaller and more affordable models for minor tasks to larger and more powerful saws used on a daily basis by even the most experienced contractors. There’s something for everyone. The following six saws our are picks for the best circular saws available for the coming year. Using our testing process and research, we’ve considered saws that span different budget levels and functions to come up with a diverse list that has something for everyone. 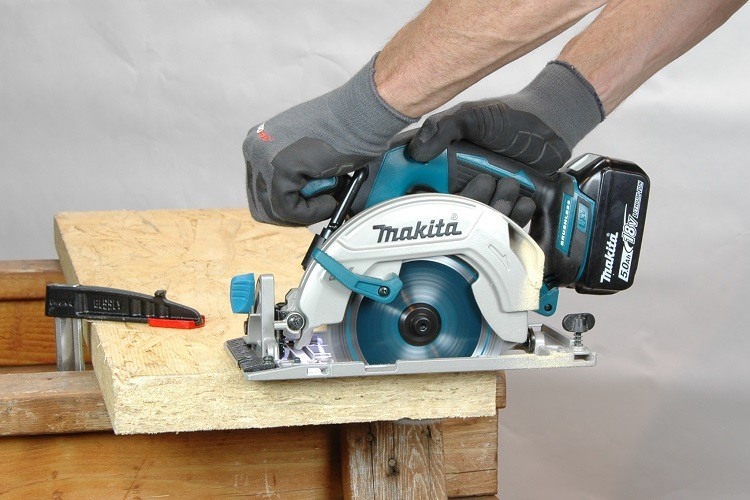 The Makita 5007MGA circular saw is built to handle a variety of tasks for even the most experienced contractor, but with enough advanced features, ease of use, and convenience to benefit beginning hobbyists who are in need of a reliable and versatile saw. The 5007MGA’s engine puts out 15 amps of power, with a max of 5,800 RPM on the blade. 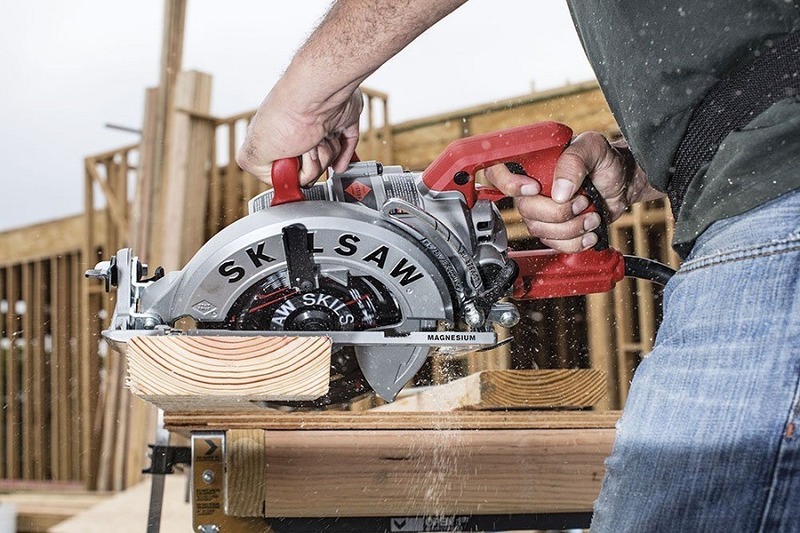 Constricted mainly from magnesium parts, the saw offers incredible power and features, while remaining at only 10.6 lbs, making it easy to maneuver without getting too tired. The saw includes a Makita 71/4-Inch coated framing blade with an advanced M tooth design that features a two-pointed tip and two 10° bevel faces to maximize cutting performance and ensure a faster, cleaner and cut. The blade’s carbide tips are built to handle the harshest conditions that include slicing seamlessly through the nail-embedded wood. The blade’s coating reduces heat and pitch build-up, while unique Makita heat vents dissipate heat for better performance. Cutting depth is at a premium as well, with 45 degrees cuts at 1¾-inch, and 90 degrees cuts at 2½-inch. The 5007MGA offers an impressive list of expanded features as well. Bright LED lights help to illuminate your sewing area for optimal vision during cutting, and dust blower directs sawdust away from the cutting area as you go for the better view and less mess on your workpiece. A blade wrench is attached to the saw, always within reach, and a reinforced cord gives the power cord added durability to withstand all the rigors and demands that come from repeated uses. An electric brake stops the blade when the trigger is relaxed. We've recently reviewed this saw. Click here to learn more. The SKILSAW SPT77WML-01 circular saw is at the top of its class in several ways, making it one of the most formidable worm drive saws you can, find. For those that are often annoyed by the sluggish feel and high weight of other worm drive circular saws, this is a perfect solution. The SPT77WML-01’s dual-field motor is the best in its class, powered by a 15 amp motor that was specially designed for keeping cool during use. The saw has a no-load RPM of 5,300, with substantial torque that you can definitely feel. The saw’s handle features a soft, ergonomic grip that is an excellent compliment to the cooler-running motor, both combining to let you use the SPT77WML-01 for extended periods of time with little fatigue in your hand and arm. Cut-Ready depth adjustment levers offer fast and easy adjustments for ¼ ply, ½ ply, ¾ ply and 2x, while an Anti-snag lower guard protects the blade when it’s not being used, and avoids snagging while cutting thinner materials. The SPT77WML-01 has a max cutting capacity of 2 ⅜-inch at 90 degrees, with a maximum 53 degrees bevel capacity featuring positive stops at both 0 degrees and 45 degrees. This makes it suitable deal for work such as framing, decking, siding and even ceilings. Hard, soft, or engineered wood -- doesn’t matter; it handles them all with little effort. Indents for 0 degrees and 45 degrees bevel are located on the footplate both in front and behind the blade, helping it make a right cut with ease. The SPT77WML-01 also comes with an on-tool multi-function wrench for fast blade changes and brush and oil maintenance, along with an ultra-tough 24-tooth carbide-tipped SKILSAW blade. If you'd like to read our review, click here. 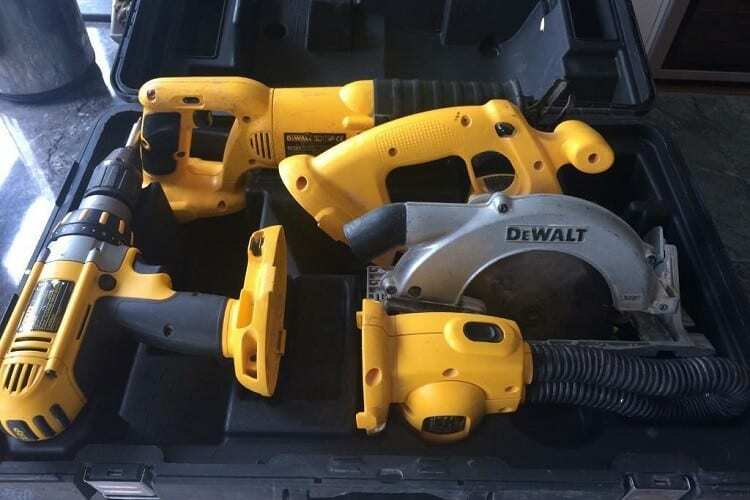 The DEWALT DWE575SB is one of the best circular saw regarding value, and also has one of the lowest overall weights you’ll encounter. It’s perfect for framers, concrete formers, general contractors, and home woodworking hobbyists who need to do everything from framing walls to cutting plywood, siding, and exterior finishing. The DWE575SB weighs only 8.8 pounds and measures 7.2 inches in width. It may be smaller and lighter, but it still offers all the power you need, with a 15 amp motor that cranks out 1,950 max watts and 5,100 RPM. The saw displays outstanding comfort and balance, thanks to an saw features ergonomic handle complete with trigger actuation. 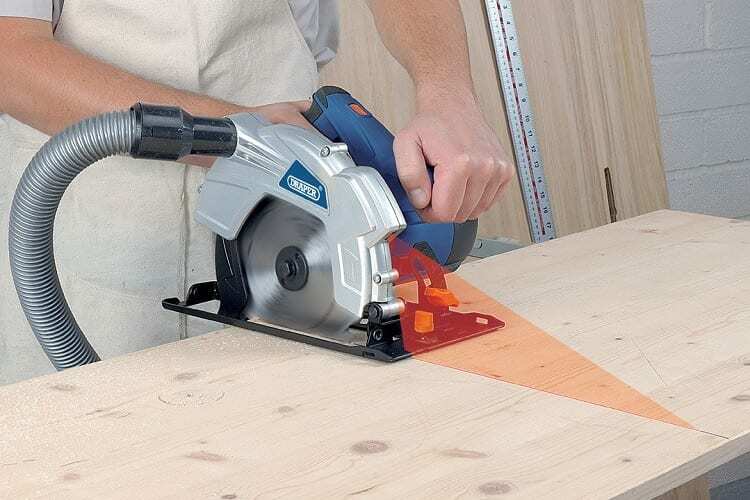 An electric brake allows the DWE575SB’s saw blade to stop around 2-3 seconds after the trigger is released, which not only ensures extra safety but repetitive cuts at a faster rate. A tough carbide-tipped blade is included with the saw, capable of handling most any type of wood. The saw’s ball bearing lower guard adds to its durability while protecting against dust contamination for a smoother retraction. A high-quality stamped aluminum shoe ensures a more durable and stable base for precision cutting every single time. The DWE575SB has a 57 degrees bevel capacity with 22.5 and 45 degrees detents, and a 2 9/16-inch depth of cut capacity, which is easily the best in its class. The saw’s Depth of Cut at 90 degrees is 2.55 inches, while the 45 degrees depth is 1.9 inches. Some other notable features include a strong cord protection system that provides superior protection against cord pull-out during a drop, along with an onboard blade wrench storage and a handy carrying case for expanded portability. If you'd like to learn more about this saw, read our review. Smaller hand-held circular saws used to be considered more of a gimmick took that really weren’t all that helpful or appropriate for worksite use, but advances in technology and design over the years has completely changed that, and the Rockwell RK33441K is a prime example of progression. 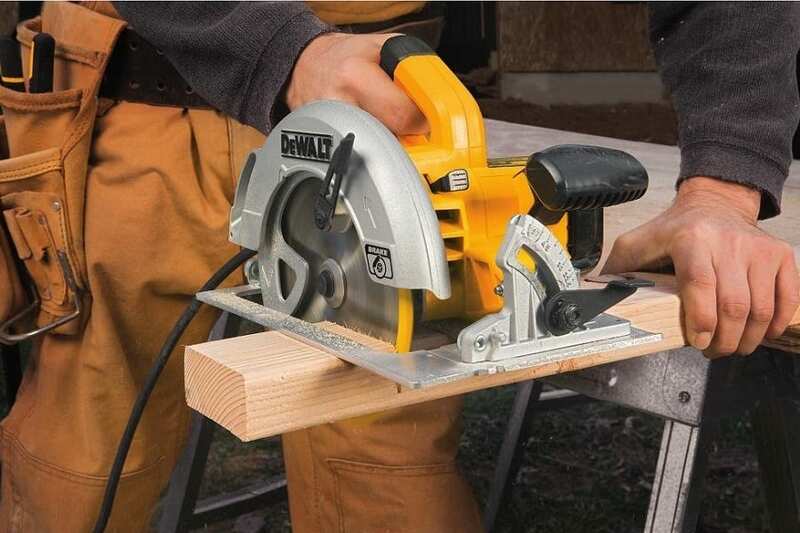 This is a compact circular saw in every way, but it doesn’t always feel like it. What you're getting here is more of the feel you’d get from a conventional circular saw, shrunken down to a handheld size. The design and power make it great for tight spots, or times you just don’t want to haul around a standard-sized saw when working with smaller wood pieces. A surprisingly powerful 5-amp electric motor is at the heart of it all delivering stellar performance at 3,500 RPM, efficiently to cutting through 2x4s in just one pass -- even boards with nails. The saw is 4 ½-inch and weighs only 5 lbs, which is substantially lighter than full-size saws. The saw’s slim inline grip design provides a right amount of comfort and control, making it great for overhead cuts, or anywhere you may need a bit more reach. A left-handed blade design improves your cut line visibility, only adding to its versatility and ease of use. The RK33441K includes a 4 ½-inch blade that has a kerf that’s about half the thickness you’ll find with larger saws. The smaller, thinner blade requires less effort from the motor, helping it run cooler and more efficient so you can work longer. Maximum cutting depth at 90 degrees is 1 11/16-inch, and bevel capacity at 45 degrees is 1 1/8-inch. Want to read our review? Click here. If you’re looking for a great value with a full-size circular saw, but want to spend the least amount of money as possible, meet the Hitachi C7SB2. 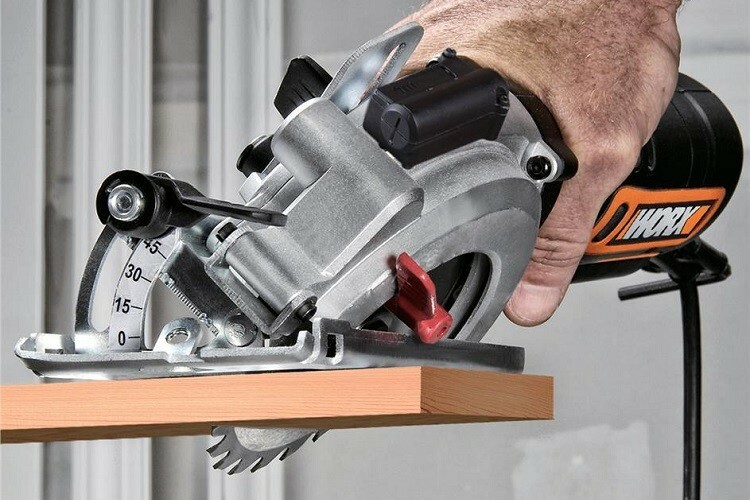 This saw packs an astounding value into a 7 ¼-inch package, making it the best choice for the budget-minded woodworker who needs the functions of a conventional saw, with minimal cost-effect. The C7SB2 uses a single-phase 120-volt, 15 amp motor that generates a no-load saw speed of 5,800 RPM, with an output of up to 2,100 watts. This gives it the comparable power to some models that are two or three times the price and allows it to handle a number of tasks. The saw’s handle is made from non-slip Elastomer, giving you total control during cutting, and providing plenty of comforts that won’t leave your hand worn out after extended use. The C7SB2 weighs in at just 10.1 pounds, so you’ll have little trouble maneuvering it or carrying it around. The C7SB2 comes with a 7 ¼-inch, 24-tooth, carbide-tipped blade with a ⅝ inches arbor that can slice through most any wood material easily, including smaller nails. It has a 1 27/32-inch depth of cut at 45 degrees and a 2 ⅜-inch depth of a cut at 90 degrees. A cutting depth lever gives you quick access to your ideal depth in just a few seconds. The saw includes a hard carrying case with each purchase, a carbon brush, and a five-year limited warranty. Read our in-depth review by clicking here. 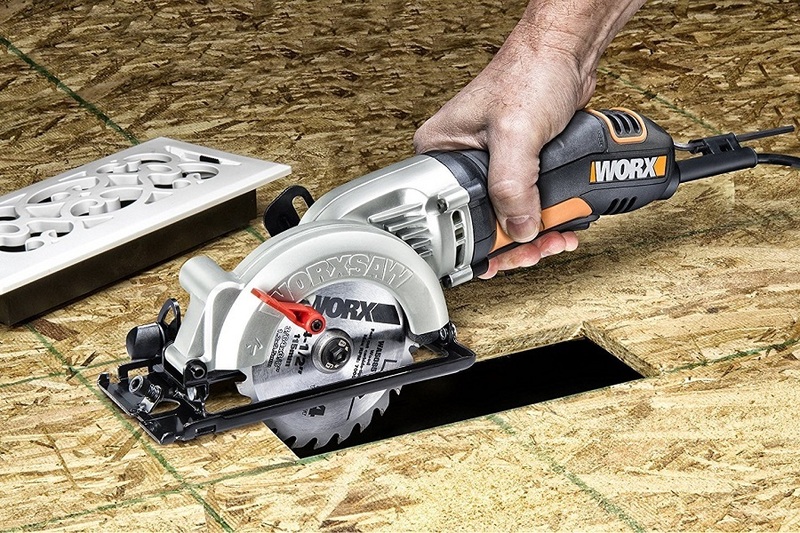 The WORX WX429L compact circular saw is an immensely popular hand-held saw that we hear about frequently, so we had to give it a shot. It didn’t take long for us to see what all the fuss is about. 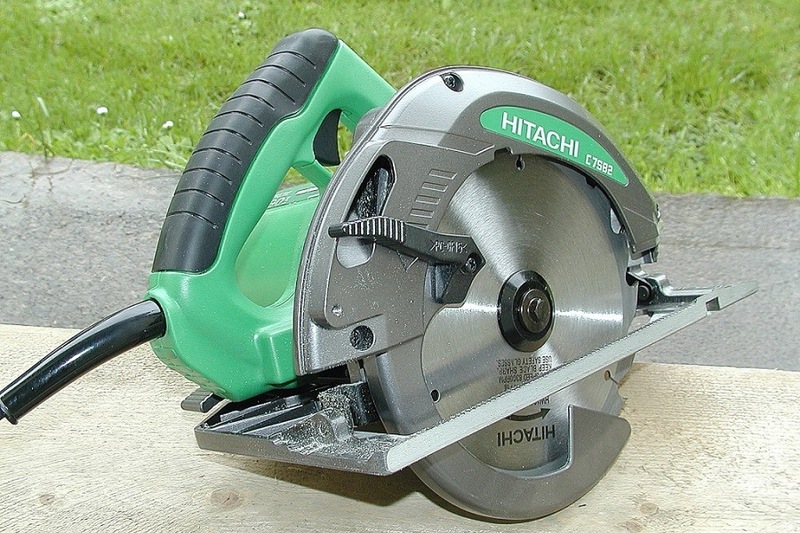 This is a very versatile compact saw with an adequate amount of power and an unbeatable price. 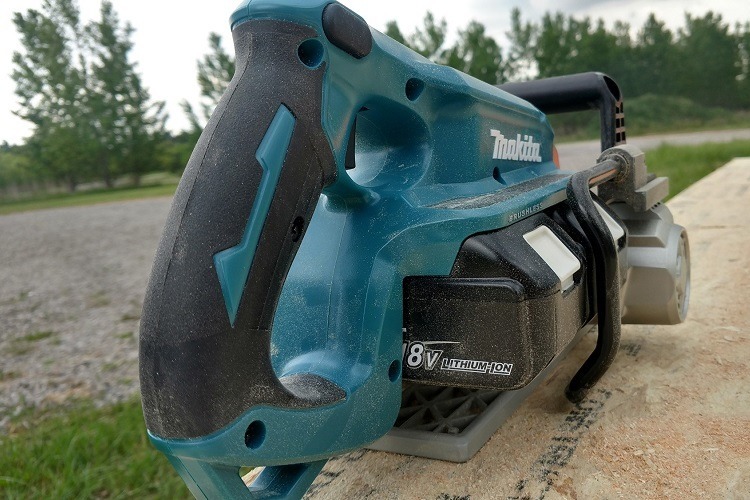 Like other compact saws, this one is 4 ½-inch, and operates with four amps of power, which is a little lower than what we’re used to seeing from this size. Fortunately, it seems to be more efficient than other models, displaying no drop-off with power whatsoever. The saw’s soft and slightly ergonomic grip has an integrated safety trigger for an impressive combination of comfort, balance, and control that makes it feel very stable when cutting, as opposed to that flimsy feel you sometimes get with others. A left-sided blade design provides good cut vision. The WX429L even comes with a parallel guide attachment to ensure more precise cuts, while also making quick depth adjustments up to 2 using the depth guide”. Bevel cuts up to 45 degrees can be quickly achieved using the saw’s simplified plate. The saw’s thin 24T carbide-tipped blade design lets the saw operate with less strain, improving performance without hindering any speed or torque. You’ll have no trouble quickly slicing through 2x4s, or any other wood with a 2 inches depth. Maximum depth with the WX429L’s blade at a 45 degrees angle is 1 ⅛-inch, while a 90 degrees angle offers a depth of 1 11/16-inch. The WX429L also comes with a vacuum adapter for sawdust removal, an Allen key tool for changing blades, and Manufacturer’s 3-year warranty. 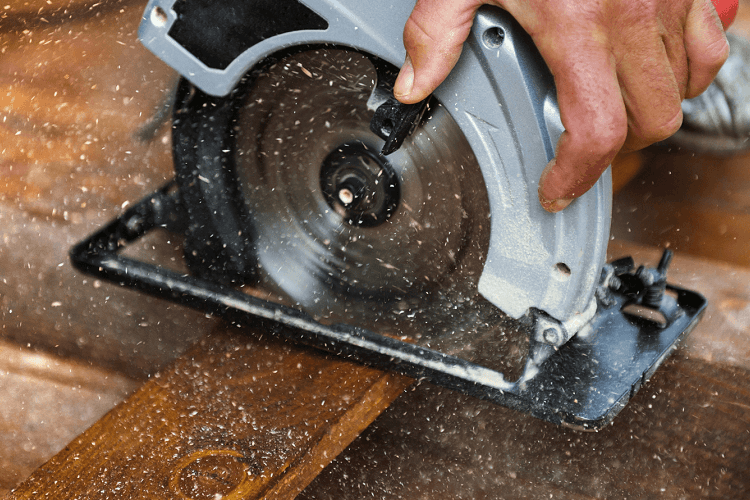 Why Should You Choose Your Circular Saw Carefully? Before we get to that, however, let’s first go over some vital information you’ll need to know before shopping, to ensure that you end up with the right saw for your project needs. It may be tempting to view most circular saws the same. They all have a handle and a round blade that cuts stuff and really aren’t all that complicated. This is understandable when glancing at a saw, but there are far more intricacies that you may not immediately notice. The variance between different models of circular saws is notable. Some have more power than others, while others are capable of making different-sized cuts, or handling wider boards. Choosing the right circular saw involves being aware of what you’ll need it for, and what kind of specs and features are going to be most needed for you on a regular basis in regards to your projects. If you end up with the wrong saw for the job, you'll get inadequate results, and might even create a safety risk as well. Plus, these saws are not cheap for the most part, so ending up with the right saw also prevents you from wasting money. If you’re woodworker on any level, a circular saw is an absolute must. In fact, it’s rather easy to argue that a woodworker’s saw collection should start with a circular saw, and go from there. There are plenty of reasons for this, but we’ll cover the three main ones. Circular saws can be used in a number of different capacities, sawing both small and large pieces of wood and lumber in many ways. They can provide cross-cuts, rip cuts, and plunge cuts with ease, often only requiring a few quick adjustments beforehand. These saws also come with a bevel adjustment that can let you cut an angle, making fast work of longer pieces that would take forever using other methods. The different blade types that can be used with circular saws add to their versatility as well. While these saws are commonly associated with woodworking, they can easily be fitted with other blade types that allow them to cut everything from pipe to metal. Ever tried to get a miter saw or table saw onto a roof? Yeah, not likely. While these saw types definitely have their value and advantages, portability is not one of them. Circular saws are incredibly small in most cases, and can easily be transported pretty much anywhere you go. Despite their size, they can provide most of the important cut types you need on a job site, or around your own workshop. There’s no extensive setup required. Those who are more skilled can sometimes get away with using circular saws in place of other saw types that are much larger as well, so keep that in mind. Bottom line: There isn’t anywhere you can’t take these. Another reason you should have a circular saw? They are relatively cheap when compared to other saws. For the most part, you can find quality circular saws of different varieties and sizes that range anywhere from $50 to $300, depending on the power amount and extra features you want. This makes it easy for most to be able to afford the most portable and versatile of all power saws, helping you amass your saw collection without spending too much money at first. As we said earlier, circular saws appear to be simple tools at first, but they contain many different aspects that cover everything from their power and size, to the additional features and functions that can improve the quality and usefulness of the saw. Here are core characteristics to be aware of when shopping. It sounds a bit ambiguous in a way, but each saw really does have its own unique feel. This involves a combination of things like its size, weight, handle shape and location, etc. Since sawing and woodworking are reliant on your own accuracy when using the saw, a proper feel is essential to ensure that you achieve a quality cut each time. The type of circular saw factors into the feel as well. Sidewinder saws are perhaps the most popular of all and have a side-mounted engine which helps to keep the weight down while letting you rest the saw on the workpiece easier. Worm drive saws have the motor in the back, are longer and narrower, and are better for cutting wider boards and making plunge cuts. 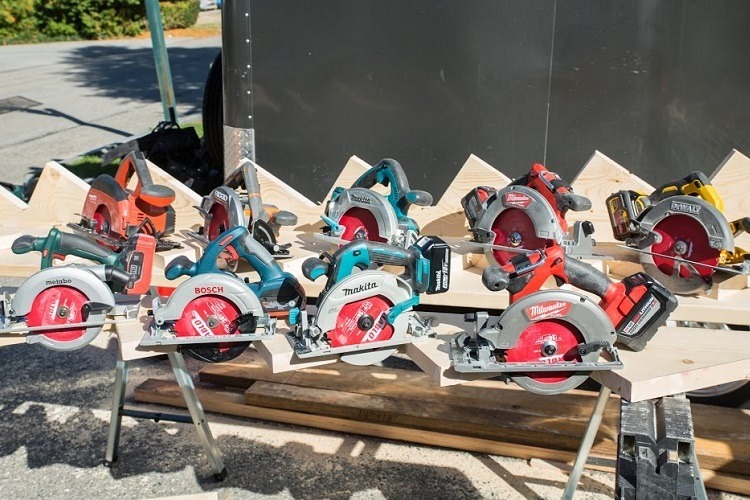 Compact saws are nearly half the size of conventional saws, and can easily be operated with one hand, making them great for cramped spaces and small pieces of wood. The shoe (sometimes called a plate) is the square-like assembly that goes around the saw in the center of the blade. This is where the saw rest on the workpiece, allowing you to slide it across in a smooth and controlled way. The shoe is an essential component, as it’s responsible for the quality of the cut. A bent shoe can throw everything off. Cast-metal shoes are very durable and able to withstand falls and drops without bending as easily. Flat aluminum shoes weigh less and help make the saw feel more nimble overall, but are more prone to bending when dropped. In this case, it’s all about your preference. Bevel cutting refers to the process of cutting a part with an edge that is not perpendicular to the top of the workpiece. This is not to be confused with a miter saw, which cuts an angled cut on the surface of the wood. The bevel capacity of a circular saw indicates the maximum bevel cut the saw can make. While some users may not use a bevel cut very often, others may need more than just the standard angles that come with some models. In addition to an expanded bevel capacity, a more substantial number of preset bevel stops can be useful to some as well. Depth adjustment refers to the raising and lowering of the blade. In most cases, you’ll want your blade to protrude out from the bottom of your workpiece by around 1/4th of an inch. This can vary with different workpieces, however, and not all of them will be even. Different saws may have different ways of adjusting the depth, with some making it much more comfortable than others. This often involves moving the shoe up in down, but not always. Safety is apparently a primary concern with any saw. 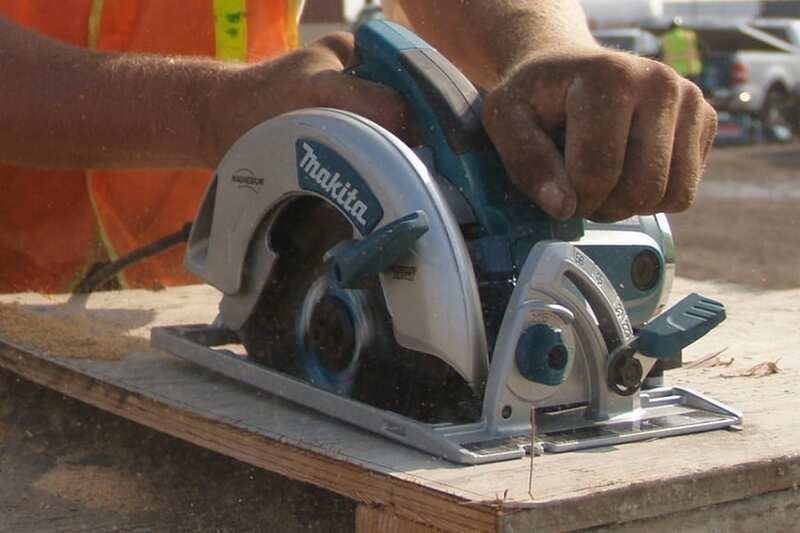 There are a few individual features of a circular saw that improves the safety aspect, primarily with a brake. You can probably think of more than a few reasons as to why it’s a good idea to have a brake on a circular saw. While not entirely essential, having a circular saw with a brake on it is preferred. Electric brakes are used to reverse the flow of electricity in the saw’s motor whenever the trigger is released. Reversing the current stops the blades faster than just letting it spin on its own until the momentum stops. These brakes are often able to stop the blade in as little as two seconds. Blade guards are another great safety feature that you should look for. While there is always a blade guard on the top portion of the blade, there isn’t always one for the bottom. Some saws have a retractable bottom guard that can be raised and lowered with a lever in just a few seconds. Work Lights - You should obviously always work in a well-lit area when cutting any type of material, but sometimes the circumstances can create small shadows and other obstructions that limit your view to an extent. Work lights on a circular saw are now usually LED lights that can project an extra amount of light onto your workpiece and working area. This full illuminates the workpiece and lets you see even the smallest details much easier, which can sometimes make a huge difference in the final results. Laser Cutting Guide - It’s no secret that precision is the utmost priority when making any cut. While this does get easier over time, as your skills increase and you get more accustomed to your saw, a little assistance is always appreciated. Laser cutting guides can actually project lasers onto the workpiece, showing the exact path of the blade before you cut. This allows you to make sure everything is lined up perfectly beforehand, using the laser guide as a preview of the cut. Blade Wrench - Different blades are used for different materials, so you’re going to be changing out the saw’s blade from time to time. A blade wrench is used to loosen the part holding the plate onto the saw. As you can imagine, these wrenches are small and hard to keep track of, and sometimes the saw won’t even come with one. If possible, look for saws that not only come with a blade wrench but have a small compartment or holder where you can place the wrench directly on the saw when not in use, always giving you quick and easy access to it. We go through quite a bit of testing when creating these buying guides, in order to ensure that we pick the right ones and see them up close and personal -- not just on a product listing. This arguably the most crucial aspect for many, as there’s no use having a saw that’s not powerful enough to make quick work of the items you’ll be cutting the most. Power is something that is listed in the specs, but it’s more meaningful when you can see what the saw does with that power in person. To ensure this, we make a variety of cuts to the same size of workpiece, which includes rip cuts, crosscuts, and bevels. Quality saws will have no problem with any. There are a few different characteristics that go into this to create the overall feel in the end. The handle itself is a significant part. The handle should be located in an ideal spot, and a little ergonomic design is always appreciated as well, In the end, you should feel secure and like you have full control at all times. The weight comes into play here as well. Heavier saws are going to feel a little more stable when cutting through items, but sometimes the handle isn’t designed well enough to counter the weight. The same can be true for lighter saws too. The line of vision also fits into all this. Adjusting the depth and bevel are two things you’re going to be doing quite frequently when using a circular saw, so the easier it is to make adjustments, the better. We prefer a right combination of presets, and manual adjustments, with both levels and dials. Making these adjustments should not be a chore, but rather a smooth process, so we make sure to go through a cycle of different depth and bevel adjustments. Changing out the blade is another frequent process with a circular saw, so it needs to be quick and easy. There is more than just unscrewing the blade of the saw; you’ll usually need to move the bottom blade protector out of the way, and sometimes the top one as well. This all factors into the degree of difficulty in changing the blade on the fly. The quicker and easier, the better. This isn’t something that is “tested,” but it certainly factors in. We aren’t fans of overpriced tools, so we always consider the saw’s performance, extra features, and versatility in regards to its price, and note any discrepancies that don’t line up regarding value. 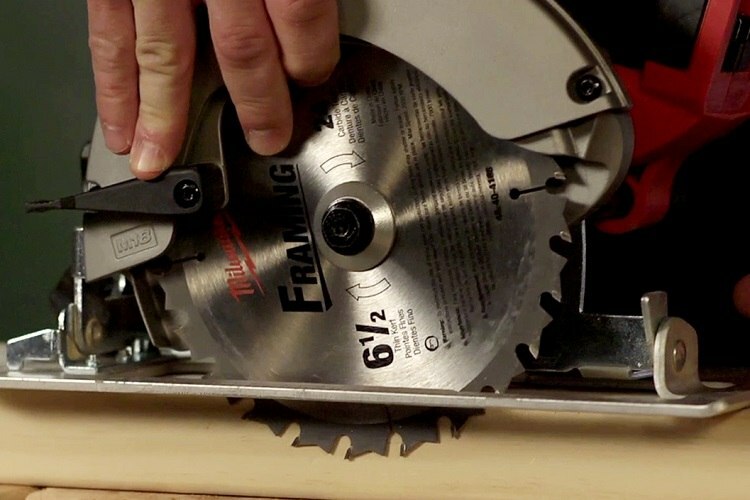 As we’ve said before, circular saws aren’t the most complicated power tools you’ll use, but they are among the most useful. Hopefully, you have a much better idea of how to navigate the marketplace when looking for your new saw. While the saws listed above vary in several ways, we can truly say that any of them are great purchases. Just make sure to double-check what your needs are, decide on your budget, and go from there, taking full advantage of our research. We’re already excited for the next round in 2019!